An accurate method of detecting wood decay and hollows or cavities in living trees is useful for risk assessment and maintenance of both forest and urban trees. This study presents the implementation of the four-point electrical resistivity method for the early detection of the presence, location and extent of wood decay and hollows in living acacia trees (Senna alata L.). Electrical resistivity measurement of randomly selected living acacia trees and a freshly-cut acacia tree with decay and hollows were taken to obtain electrical resistivity profiles for sound, decayed and hollowed trees. A laboratory experiment was set up to replicate the resistivity profiles. Wood decay and hollows were replicated at different depths in the laboratory prototype using good electrical conductors and insulators respectively. Resistivity profiles for the sound, decayed and hollowed trees were obtained from the experimental and field results. The resistivity profiles were applied to detect decay and hollows of similar dimensions in living trees through resistivity curve matching. The electrical resistivity of the decayed acacia tree was markedly lowered by an average factor of 5 compared to that of the sound acacia tree. Likewise, the electrical resistivity of the hollowed acacia tree was noticeably greater than that of the sound acacia tree by an average factor of 4. 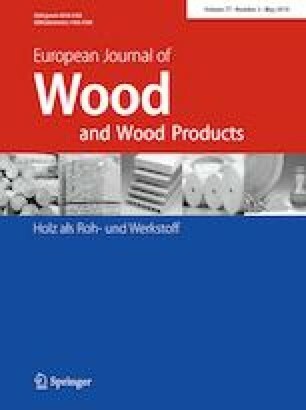 Wood decay and hollows modelled into the laboratory prototype were detected with relatively lower and higher resistivity anomalies respectively. The method indicated that 80% of the randomly selected living trees were sound, healthy trees, whilst 20% had decay and hollow at the time of measurements. This method is suitable for early detection of decay and hollows in hardwood trees. The online version of this article ( https://doi.org/10.1007/s00107-019-01402-1) contains supplementary material, which is available to authorized users.